Sheeba were an all-girl pop trio and were popular in Ireland and Japan in the late 1970s and early 1980s. Sheeba consisted of Maxi (who sang the Irish entry in 1973), Marion Fossett and Frances Campbell. 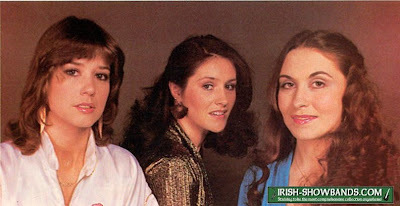 They are best known for representing Ireland at the Eurovision Song Contest in 1981 with Horoscopes which came 5th. In 1978 the group took part in the Irish national final with their song It's Amazing What Love Can Do which came 6th. They went on to release several singles in Ireland with producer Roberto Danova, although their biggest hit was Horoscopes in 1981, which reached No.3. Following their exposure in the 1981 contest, they signed a recording contract in the UK and released the singles The Next Night and Mystery, neither of these found success however. The contest also led to concert tours in Europe and Japan. The following year they entered the Irish national final again with a song performed in Irish called Go Raibh Maith Agat (Thank You Very Much) which came 7th. Later in 1982 they were involved in a road accident in the West of Ireland that brought their career to an eventual halt due to their reluctance to continue touring. Shortly after the accident Sheeba represented The Netherlands at the World Popular Song Festival in Japan with the song Don't Know How which stranded in the semi-finals. After a Japanese tour in 1983, they decided to split, but did compete one more time in the National final in 1984, where they finished 4th with the song My Love And You. Today, Maxi is a successful broadcaster with RTÉ in Dublin, Marion Fossett is ring-mistress of the well-known family circus Fossetts, and Frances Campbell is a broadcaster in Northern Ireland.